If you’re puppy is starting to look a little pudgy your rabbit has gotten rather rotund or your cat is just plain fat, too many treats is the likely culprit. It can be very hard to resist the charms of a pet asking for a treat, but there are very good reasons to abstain. But, It’s Just One Treat! Make sure everyone understands that pet obesity is a serious problem. 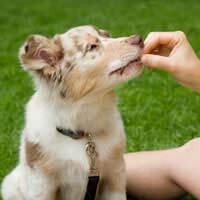 Young kids in particular have a habit of overfeeding treats as the response they get from their pets is so great when a treat is received. Animals know that kids are easy marks and will pour on the extra cuteness factor, too. Since younger children still haven’t developed a true sense of consequence, they have a hard time seeing the harm they are causing their pet’s bodies. All they see are those huge, pleading eyes! So help your kids to stay strong in the face of cuteness and make a family pact to look out for the weight and welfare of your pet. Split a treat in half, or even quarters. That way, kids will get a chance to give treats as many times without causing all the extra calories. Treats should only make up 10 percent of an animal’s diet so do some quick calculations and figure out what adds up to a healthy pet. Nutritious, less fattening treats can greatly aid in reducing pet obesity as well. The problem with many shop bought treats is the high quantities of sugar, fat and carbohydrates that make them tasty to your pet. Read the labels of treats to find the ones that are low in fat and sugar but high in fibre. Also, switching over to some healthier alternatives such as home made treats (if you have the time to make them) or vegetables like carrots, cooked green beans or broccoli. If you have a small pet, try to give veggies as treats rather than fruit, which have a lot of natural sugar. Rabbits in particular can become quite obese from too much fruit. When is the Right Time to Treat? Giving an abundance of treats undermines the effects of giving a treat at the right time. Treats are an important supplement during the training process of your pet to reward them for good behaviour or to reinforce what you would like them to do. Treats can also encourage the bonding process between kids and their pets, so make an allowance for an occasional treat for this purpose as well. Families should never give begging animals treats, though, as this only reinforces negative behaviour on the part of your pet without the positive encouragement of training rewards. A treat for no purpose is empty calories, indeed.